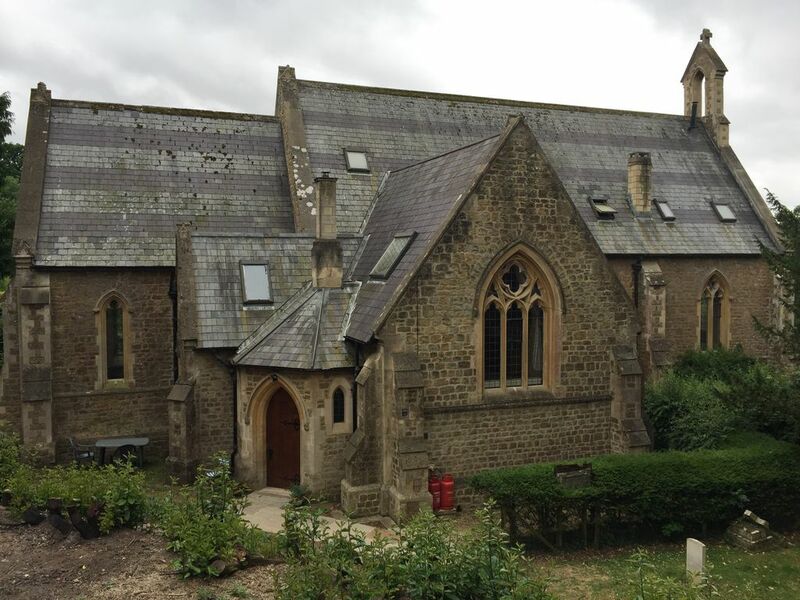 The North Transept is a self-contained annex to our converted Victorian Gothic church. We have done all the conversion ourselves to a very high standard, and the high ceilings and beautiful Gothic windows make it a unique space. The church is part of a small hamlet called Chittoe, situated in a beautiful hidden valley in the Wiltshire countryside; it's surrounded by fields and with lovely walking from the door. It's also easy to get to lots of Wiltshire attraction and just over half an hour to the Georgian city of Bath. The church was built for the local country house estate in the mid-19th century and was deconsecrated in 1980. We have been converting the church since 1988 - it is our family home. The North Transept has its own separate entrance from the outside into its own lobby which is a good place to leave your coats, shoes and boots. This then opens into the North Transept - an impressive double height space. On the ground floor there is: a comfortable living and dining area; a fully equipped kitchen with electric oven, gas hob, microwave, coffee maker and plenty of cupboard and worktop space; a bathroom with bath and shower. Stairs lead up to a mezzanine which has a comfortable king size bed with hanging space and drawers. At this level there is a large beautiful Gothic window which looks out onto the old graveyard and beyond to open fields. The whole space has beautifully high ceilings with exposed beams but is warm and cosy with underfloor heating under the stone ground floor. The sofa on the ground floor level is a double sofa bed, for which bedding can be supplied on request. Access to the North Transept is step free with wide doorways making it wheelchair accessible; wheelchair users who are unable to get upstairs would be able to sleep on the sofa bed. The North Transept has Wi-Fi, telephone, smart TV and an audio system with an aux lead so you can plug your own music in. - The Old Church is set in its own two acres of landscaped gardens with mature trees and shrubs, pond and summer house which guests are free to explore and enjoy. - There is loads of car parking and guests can park their car in one of the bays of our earth sheltered garage in the grounds. - Guests will be welcomed on arrival and shown around the North Transept and the grounds. We provide some things so you can make your own breakfast – there are: various teas, fresh and instant coffee, sugar, granola, milk, orange juice, sliced bread and croissants in the freezer, jam, marmalade and butter. We will be available or contactable during throughout your stay if you need assistance. The North Transept is located in Chittoe a quiet hidden valley with lots of lovely walks directly from the church and many others just a short drive away. It is in hamlet of less than 20 houses and on a no through lane so it's very quiet and peaceful (apart from the sounds of the owls, pheasants and Muntjac deer!). As well as walking and enjoying the peace of the countryside, there are loads of other things to do in the area. Nearby are: the market town of Devizes with Wadworth Brewery and the Kennet and Avon Canal with its famous Caen Hill flight of 29 locks; the National Trust village of Lacock which has Lacock Abbey and has been used as a set for various films and TV programmes; Bowood House with its famous Capability Brown gardens and golf course, spa and children's adventure playground; the Neolithic stone henge monument at Avebury, Silbury Hill, and the West Kennet Long Barrow; the picturesque village of Castle Combe; the historic market town of Corsham with Corsham Court; the market town of Marlborough; the Georgian City of Bath is about 35 minutes away. There is a variety of places to eat nearby including village and town pubs and a range of restaurants. There is a well stocked farm shop about 5 minutes away, a village shop about 10 minutes away, and a range of supermarkets within 15-20 drive. - There is plenty of free parking for the North Transept. - The local train station is Chippenham. - There are plenty of local taxi firms. - There are various cycle routes. - Bristol airport is about an hour away, and Heathrow airport is about an hour and a half away. The bathroom has a wash basin, toilet and bath with shower over bath. It is supplied with plenty of white fluffy towels, hand wash, hand cream, shower gel, shampoo and conditioner. Two acres of landscaped gardens with mature trees and shrubs, pond and summer house which guests are free to explore and enjoy. A wonderful short break in a unique setting! Beautiful property and grounds, extremely clean and comfortable. And very helpful hosts, on hand with useful information if required...thank you! A heavenly short stay for much needed revival! Sarah was so welcoming and very helpful in telling us all we needed to know about the area. The North Transept is beautifully done, the kitchen is fully kitted out and the croissants felt for us in the freezer is a lovely touch, comfy bed and sofa, and under-floor heating. We were lucky to have some winter sun and enjoyed it on a swing bench in the garden.. Bliss! This little jewel was even more breathtaking in real life than it is in the photos. The grounds are absolutely stunning, nestled into a secret valley. We saw lots of pheasants, owls and even a muntjac deer! The transept itself has been beautifully and sympathetically restored. The underfloor heating makes it wonderfully warm. The whole place is immaculately clean. And thoughtful touches like the complimentary croissants and bean-to-cup coffee maker (amazing) were the icing on the cake. I can only imagine how much more beautiful this place must be in the spring, summer and autumn. It's such a gem, you really don't want too many people to know about it! Definitely hope to return one day. Perfect weekend away; friendly welcome, amazing unique property beautifully renovated. Lots to do, walking, visiting nearby towns and good pub close by with good menu and very tasty meals. Will definitely return. Perfect location and perfect property! It was everything in the pictures and so much. The gardens are amazing, our stay was in November but we were very lucky with the weather, our granddaughter loved the swing in the grounds. The accommodation its self is amazing, the bed was so comfy I did want to get up! But I leave all of the rest to surprise you, but its beautiful, warm and comfortable..
r Thank you for your very kind review. I’m very glad you found the swing! I booked this for my parents and they had nothing but lovely things to say about not only the property but Sarah and her husband, bit jelous I didn't get to go! Absolutely amazing cannot express how much they loved their time here!